After using it in the last post on non-positively curved surfaces, I thought it might be nice to give a simple proof of the Okamura-Seymour theorem in the dual setting. This argument arose out of conversations in 2007 with Amit Chakrabarti and former UW undergrad Justin Vincent. I was later informed by Yuri Rabinovich that he and Ilan Newman discovered a similar proof. Note that establishing a node-capacitated version of the Okamura-Seymour theorem was an open question of Chekuri and Kawarabayashi. Resolving it positively is somewhat more difficult. Theorem 1 Given a weighted planar graph and a face of , there is a non-expansive embedding such that is an isometry. Proof: Fix a plane embedding of that makes the boundary of the outer face. Since is -connected, is a cycle, and since is bipartite and has no parallel edges, . Consider an arbitrary pair of distinct vertices on . There is a unique path from to that runs along counterclockwise; call this path . Consider a path and a vertex . We say that lies below if, in the plane embedding of , lies in the closed subset of the plane bounded by and . We say that lies strictly below if lies below and . We use this notion of “lying below” to define a partial order on the paths in : for we say that is lower than if every vertex in lies below . If are distinct vertices with preceding and , then and . If is lower than and , then . Note that a suitable pair exists because . Finally, we define the cut as follows: does not lie strictly below . Claim 1 The cut satisfies the conditions of the lemma. For the rest of this section, we fix the pair , the path and the cut as defined in the above proof. Lemma 1 Let and be distinct vertices on and be such that . Then . By property (3), we have , which implies . Since is bipartite, the cycle formed by and must have even length; therefore, . Lemma 2 Let and be distinct vertices on and . Then . for some where, for all , and . Let and denote the endpoints of with preceding in the path . Further, define and . The latter quantity is precisely which completes the proof since . Let be a path in that achieves the minimum in the above expression. First, suppose . Then we must have . Now, , which implies and we are done. where the first line follows from Eq. (1) and the definition of and the third line is obtained by applying Lemma 2 to the path . If at least one of lies in , then and we are done. Using this in (**) above and noting that , we get . This completes the proof. Proof of Theorem 1: Assume that is -connected. We may also assume that is bipartite. To see why, note that subdividing every edge of by introducing one new vertex per edge leaves the metric essentially unchanged except for a scaling factor of . We shall now prove the stronger statement that for every face of there exists a sequence of cuts of such that for all on , we have and that for , . We prove this by induction on . The result is trivial in the degenerate case when is a single edge. 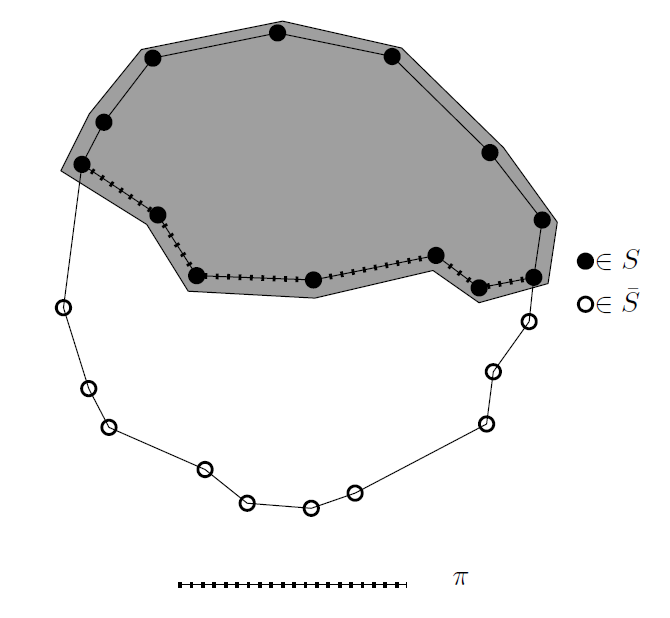 For any larger and any cut , the graph is either a single edge or is -connected. Furthermore, contracting a cut preserves the parities of the lengths of all closed walks; therefore is also bipartite. where the first equality follows from the property of and the second follows from the induction hypothesis. This proves the theorem. Ah, it looks like you’re having the same LaTeX rendering issue that I have too – as of about 24 hours ago, it appears that the wordpress latex renderer is offline (other than from any cached images for latex fragments that had previously been rendered before this time period). I’ll try to report the issue. Perhaps this was intermittent? I didn’t notice a problem authoring the post, and now it seems resolved. Actually our work on Busemann spaces followed a paper by Victor Chepoi and Bernard Fichet http://link.springer.com/article/10.1023/A:1004907919611 from which the dual OS follows easily. Guyslain, thanks for the pointers. The proof with Sebö you reference is really interesting.